In my last post, I gave you a “tour” of our living room, but left out a critical piece of furniture. That’s because I think it deserves its own post! I bought it from a friend when I moved into my first apartment after college and I absolutely love it, but it was just too small for the space in our new house. I was in desperate need (or lust) for a larger round or square coffee table. First it was just that I wanted a new size and shape, but then it turned into an obsession with an oversized tufted ottoman table like the one here, but I wasn’t down for the price tag. So I found a tutorial on how to make one myself at the Little Green Notebook and quickly found the perfect size and shaped coffee table at the local Salvation Army. It’s 38×38 inch square. The top needs major sanding and restaining, but check out the gorgeous detail on the sides and the legs. 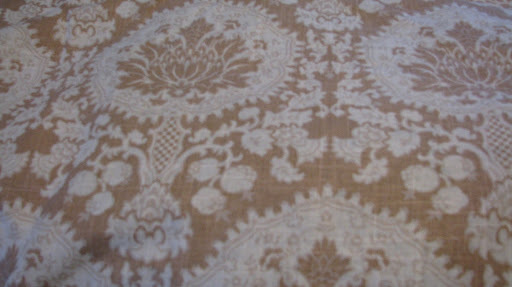 I also found some fabulous fabric at a local discount fabric store that I’d love to reupholster it with. I ordered custom cut foam to fit the top and purchased batting from my local Joann’s Fabric Store. But I’ve been keeping the table in the basement and didn’t bring it into the living room around the rest of my furniture until I was getting ready to upholster it and I realized that once I added the foam and the batting, it was just too tall. I could cut the ball feet off to shorten it, but that would definitely take away from the character and shape of the piece. And then I got this great estate sale piece I talked about in my last post. 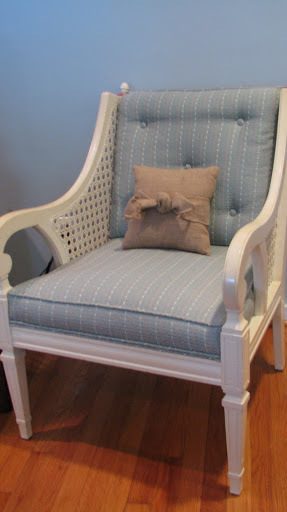 So now I’m thinking I may use the fabric for the chair and just do a total makeover on the coffee table by sanding it down and staining it with leftover dark walnut stain we used recently on our front french door. Pulling the fabric and batting over the side would hide so much of what I love about the table. And that would leave me enough fabric for a couple of throw pillows to scatter around the rest of the furniture so that the fabric shows up in different areas of the room. So loyal readers, all 1 or 2 of you, what are your thoughts? I think for now I am going to work on staining the table until I make my final decision. But your opinion is desperately needed! 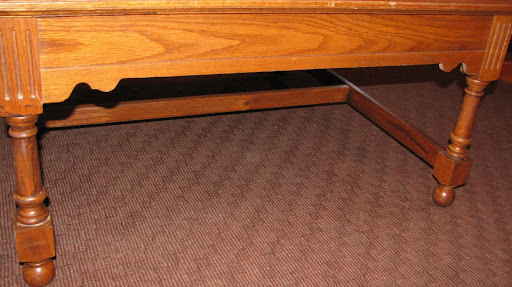 What does the top of the coffee table look like? 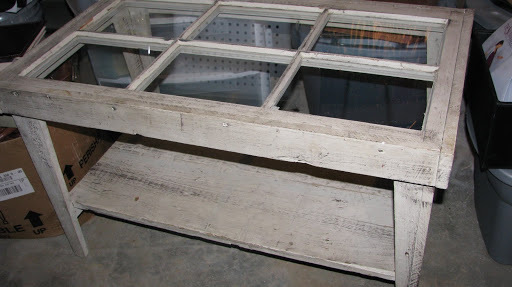 Unless it is really ugly/beat up, maybe you should sand/stain. If it will be used as a coffee table, and something got spilled on it, the upholstery would be a pain to clean. Thanks Meghan! Yeah, I'm thinking between the dogs and my clutziness, a fabric table is probably not the way to go. I think Gusty and I are going to stain the table tonight! I'll post the end result! One more question. How thick is the foam you ordered? If you have your heart set on an ottoman, maybe you could get a thinner piece of foam that would suit you. Good luck – I look forward to seeing the finished product. First time here and since you're asking, I think you should think about sanding the piece. I like to put my feet up but I also like to be able to set a cold or hot drink on my coffee table and that isn't easy if it is upholstered. As you wrote, cutting off the feet would be a terrible solution since you would loose some of the beauty of the legs. That's my opinion and I'm sticking to it! Oh, the choices… I absolutely love that estate sale chair. The lines are so pretty. I can't wait to see what you do with everything!